For some reason I was drawn to recipes featuring chicken this week. I did substitute pork for one of them, but I know I'll eventually try it with chicken too. Chicken is so quick-cooking and versatile, it's always a winner around here! 1. Stir-fried Chicken and Vegetable Lo Mein from Mel's Kitchen Cafe. Since we were already having chicken twice, I made this dish with pork (cubed pork chops) to change it up a little. This is a very adaptable recipe; it's easy to change up the meat and vegetables to use whatever you have on hand. It had such great flavor. Even the next day I couldn't wait to eat the leftovers...always a sign of a good meal. 2. Chicken Francese - Lightened Up from Skinnytaste. Well, the recipe is lightened up...my version wasn't quite. I used whole eggs instead of egg whites, and I served it with a pile of angel hair pasta rather than a salad. With a lemon butter sauce though, I feel like you need some pasta to soak it up. Yum! 3. Lazy Girl's Chicken Enchilada Casserole from Iowa Girl Eats. Any recipe that starts with "lazy girl" is always a good sign. Dinner time during the week is usually a whirlwind, and the more quickly I can get dinner made, the happier everyone is (right before dinner time is cranky time around here). This really was easy to make, and it was so good! The only change I made was using flour tortillas instead of corn, mostly because I just like them better. Also we buy them in bulk for Mr. Quesadilla. What's for dinner for you tonight? 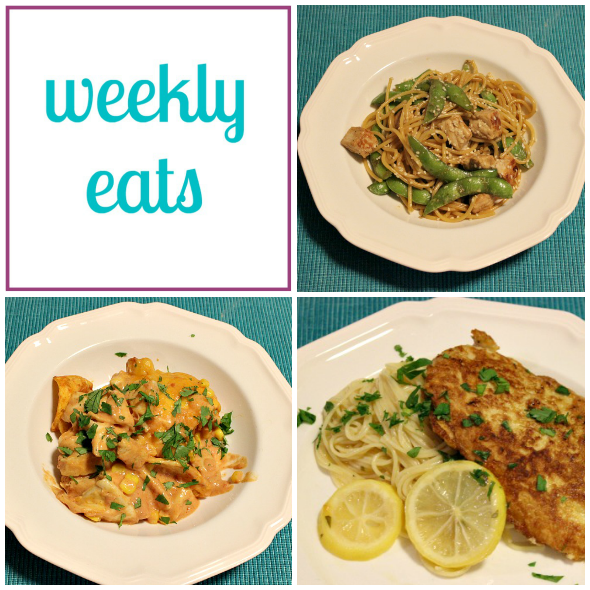 Be sure to come back on January 30th for a Weekly Eats linkup. I'd love for you to link up and share anything you've done in the kitchen lately! love this series! i need all the ideas I can get!! I haven't done that much chicken lately because I feel like it can sometimes turn out kinda boring... but then again, it really is such a versatile base! All these recipes look/sound really good, and they're all such different flavor profiles. Not boring at all. I've gotten away with lots of not-cooking this week, but I did manage to try a new (chicken!) recipe yesterday - baked chicken topped with hummus served over a brussels sprouts/potato/carrots hash (http://www.ohsweetbasil.com/2015/01/healthy-hummus-chicken-hash.html). Hummus + chicken turns out to be a tasty combo! Hendrik would say the same thing about hummus... it's one of his words :) Does Jona like it? Keep those good recipes coming - so helpful for the rest of us clearing out our freezers too, ha! We haven't had much chicken lately, but I don't even know why! I love all those recipes, they sound great! I'm excited for our dinner tonight, we're making homemade white sauce pizza. I'll be sure to include it on next week's linkup! Aahh that's so cute, hummus!! No, Jona does not. But I can't even get him to TRY anything right now. Seriously, he won't even put it in his mouth to find out if he does like it. I'm hoping this phase doesn't last much longer. Going crazy here. I swear, he knows that I want him to try things which is exactly why he's refusing. Oh yay, I'm so excited that you're going to link up!! That pizza sounds good--I LOVE white sauce pizza!! Oh crap, it's 9:04 in the morning and I'm already hungry. I might make that enchiladad casserole this weekend! Yum! Mmmm I am now CRAVING stir fry! Yum, these all look amazing!!! That is always a good measuring stick, and I'm glad you've been happily remixing this dress! What a fun dress, Shea! I also try to think of how many different ways I can wear something before pulling the trigger on it - it totally prevents me from impulse buys and regretting purchases down the line. i liked the title of this post, but i loved the pictures in it even more - that chicken francese is making me hungry! Thanks Lydia! Sometimes I can be more impulsive though...especially when it comes to shoes! Target is always a good idea! I found myself buying a lot of jewelry when I was pregnant because that was the one thing I knew I could predict my "size" in haha! So sorry - I know how hugely frustrating that must be for you as someone who likes to cook and try new things. Fingers crossed for you that it's a phase that's on its way out. My mom always says that babies (and dogs, ha) can sense our energies, so maybe if you're able to decide it doesn't matter and project that energy, it would help him be less stubborn :) It would be hard to let go though I'm sure!